Above: an unhoused steel spring from Mason, which I just learned can be purchased on Amazon, of all places (sadly, it's not eligible for Prime). If you are mechanically- or electrically-inclined, it's natural to think of these elements as presenting an impedance discontinuity at the support. That means that some frequencies "reflect" off of the discontinuity, their energy (mostly) doomed to stay trapped in the machine instead of spreading into the building. However, that also means there are some frequencies at which the spring is acting as an impedance-matching element, and it actually helps (rather than hinders) the transfer of vibrational energy into the structure. That's what's happening at the resonance, and it makes matters worse instead of better. This is why we are usually leery of neoprene-style isolators in highly vibration-sensitive settings like nanotech labs or buildings with high-end imaging suites. Most neoprene mounts are 12Hz (or so) isolators. Remember, though, that a "vibration isolator" only isolates at frequencies above 1.4x the spring resonance. And all isolators of this sort provide more attenuation at higher frequencies, and less attenuation at lower frequencies. That means that neoprene is great for acoustical problems: a 12Hz isolator might provide attenuation for frequencies as low as 17Hz (12 x 1.4). That's well below most people's range of hearing, and it's operating pretty well by the time you get up to the frequencies that people hear easily. But a 12Hz isolator isn't helping much on any machine operating below about 1200RPM, and it's actually amplifying vibrations from slower machines. 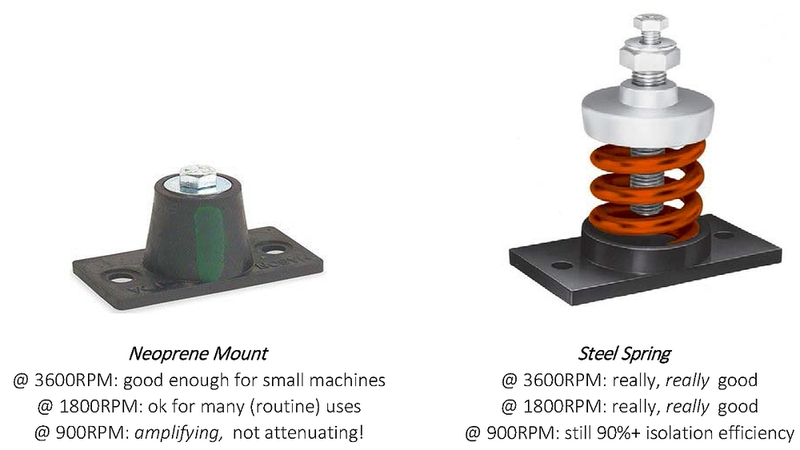 Above: a quick comparison of vibration isolation effectiveness for a double-deflection mount and an unhoused steel spring. In general, these isolators perform better at higher frequencies and worst at lower ones. 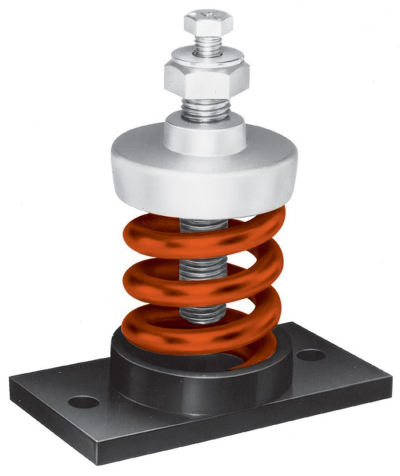 The neoprene mount is fine for many applications, but when you need a lot of attenuation or have intense vibration sensitivities, then it's hard to beat springs. That's right: if your fans run at 900RPM, you might be better off just bolting them directly to the structure rather than using neoprene. The neoprene might reduce some of the audible (higher-frequency) fan noise, but it's only making structural vibrations worse. And remember, lots of systems these days run on VFD, meaning that your 1800RPM fan might sometimes operate at 900RPM when demand is low. So when your vibration consultant tells you that he or she really thinks you should use springs instead of neoprene pads for something, there's probably a reason! Frequency matters, and it's actually possible for the wrong kind of "isolator" to make building vibrations worse instead of better. Older PostWe need a better word than "isolator"